Many people wonder whether desserts such as gelato can help with depression, relieve stress, and boost your mood. The answer is yes, having a bowl of frozen dessert can calm you and make you feel better when you’re feeling stressed, irritated or frustrated. It is even known as comfort food. Have you ever wondered why eating this refreshing, cold treat makes you happy? Many studies have been conducted to decipher the antidepressant qualities of gelato and other treats. They revealed that, although gelato contains fewer calories than ice cream, the brain’s response to depression is significantly reduced when you consume fatty foods. In addition to this, they also help decrease hunger pangs, helping get rid of your cranky mood. Let’s take a look at how gelato can positively affect your mood. 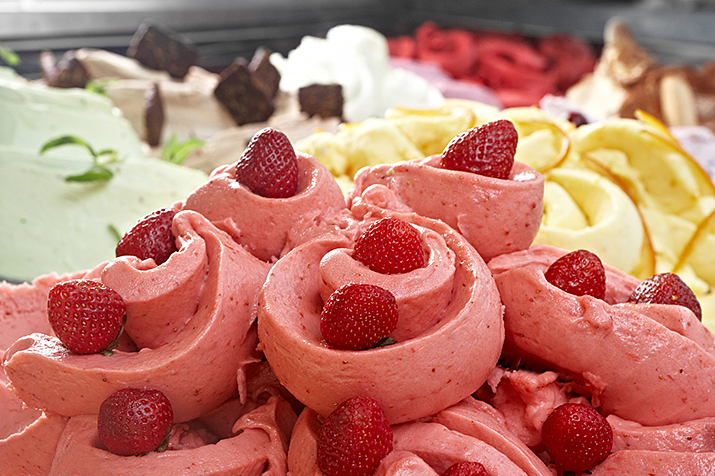 Gelato often contains proteins made of amino acid. This affects your mood positively and helps you feel better. In addition to this, these protein-rich, cold, sweet treats also boost the production of tyrosine in the brain, raising the levels of compounds such as norepinephrine and dopamine that help increase your energy. When you’re stressed out and frustrated, serotonin and tryptophan, two of the elements that help you relax, are not produced adequately in the body, leading to a bad mood. Consuming this frozen dessert helps to trigger their release, providing a calming and soothing effect. Overthinking is often the primary cause of depression. Eating a sweet treat results in a sugar rush that makes you feel happy and energized. This positive state of mind helps you to think logically, reducing sadness and negative thoughts. The fast-paced life and stress of being in difficult situations often result in mood swings that make you feel irritated and angry. Having a refreshing, cold treat such as gelato ice cream, which is considered a feel-good food, can help improve your mood, making you feel better. If you’re having a bad day or need to feel positive, having a scoop of your favourite flavour of gelato can surely cheer you up because of its antidepressant qualities and the ability to trigger the release of neurotransmitters in the brain. Depending on the flavour of the cold treat as well as the toppings used, each serving is a source of many essential nutrients such as vitamin A and B12, calcium, and carbohydrates which help maintain a healthy body metabolism, making you feel good about having a scoop or two even when on a diet. Crepe Delicious is a popular gelato shop, having a wide selection of refreshing and exciting flavours such as dark chocolate, caramel, Nutella, red velvet, tiramisu, and more to suit people with varied preferences. Our creations are hand-crafted with the freshest and finest ingredients. We have seasonal flavours on our gelato menu made using fresh, locally-grown produce. We also provide sugar-free and lactose-free options. If you are having a bad day, need something good to cheer you up, or are craving a cold, sweet treat, visit your nearest location and try our delicious flavours. You can also try our mouth-watering sweet and savoury crepes that are healthy and made to perfection!